LONDON, Ont. 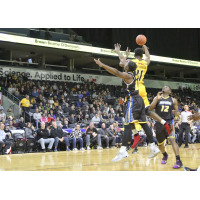 - The Saint John Riptide ended a three-game Ontario swing on a high note, downing the London Lightning 107-98 Sunday. Leading by a pair heading into the fourth quarter, the Riptide road the hot shooting of Frank Bartley and T.J. Maston down the stretch to earn the victory. Bartley led all scorers with 26 while Maston poured in 24 points. Chris Early added 14 for the 'Tide, which went 2-1 on the road trip to improved to 5-12 on the National Basketball League of Canada season. Jeremiah Mordi recorded a double-double with 13 points and 10 rebounds, while Kemy Osse also scored 13 for the 'Tide. Kirk Williams Jr., dropped 22 points to lead the 8-11 Lightning. Maurice Bolden added 18. Saint John led 73-71 heading into the final frame courtesy a pair of deep three pointers by Osse late in a back-and-forth third quarter. The Riptide opened the second quarter on a 14-2 run to open up an 11-point lead after three minutes. However, capitalizing on turnovers and excellent three-point shooting, the Lightning cut to the margin to 49-48 at the half. London led 25-24 after the first quarter. Saint John returns to the Maritimes to take on the the Island Storm in Charlottetown on Thursday before facing the Highlanders in Cape Breton on Saturday. The Riptide will be back in action on the Harbour Station hardwood Jan. 24 against the expansion Sudbury Five. The next night they'll host the Windsor Express. Starting time for both games in 7 p.m.